Fly fishing lanyards are a handy tool to keep your accessories within easy reach. You can find them in a variety of styles, from plain leather or cording to beaded decorated styles that resemble 1970s beads. The portion that rests on your neck usually has something added for comfort so the lanyard is comfortable in a variety of weather conditions. Some also have a quick release clasp for safety. If you are an angler who doesn't need too many tools at hand, a good lanyard can replace a fishing vest. In hot weather, this can be a big improvement over a heavy vest. In very cold weather, it can be difficult to fit a warm jacket under a fishing vest. Either way, a good lanyard will keep all your must-have items close at hand. If you're worried that a "necklace" will dangle if you bend over, fishing lanyards are equipped with a bulldog clip to attach to your shirt. This keeps the lanyard properly in its place whenever you need to bend or move. Angling lanyards also have several swivels and snap lock connectors so you can easily attach your needed tools. Retractor clips are also sometimes included. Many anglers use their lanyards to hold hemostats for removing hooks, a hook hone, for sharpening dull hooks, fly floatant (just hang it upside down and it's always ready to use), nippers (for trimming line), a plastic strip thermometer, and even a neoprene fly bed to hold your favorite flies. There are numerous fly fishing lanyards available on the market to fit any budget. Let's start with the most budget conscious… lanyards under $40. At the bottom of this price range, you can still get a comfortable lanyard with an attached fly box. The box has a built-in magnifying lens in the lid and features ripple foam to hold the flies. The lanyard is designed to break away in case of an emergency. Another choice in this range is a 37 inch suede lace lanyard that features a 16 inch strand of beads across the back to help it rest comfortably on your neck. A drawstring lets you adjust the length. Alligator clips hold the lanyard in place on your shirt and a built-in tippet dispenser. Five swivels are evenly spaced between wooden beads to provide room for fly fishing accessories. A nice mid-range lanyard is made of a vinyl coated stainless steel cable that maintains its loop shape even when carrying a load of tools. Choose one with or without a retractor. Or, you can choose one closer to $40 with a quick-release clip that features soft foam rolls for neck comfort. For less than $125, you also have many options to choose from. For around $50, you can get an adjustable lanyard that comes with essential tools for the freshwater angler like two spools of tippet, a line clipper, strike indicators in a dispenser, floatant, and forceps on a tether. The neck area is padded with foam rolls for comfort. Alligator clips keep the lanyard from swinging and dangling. For a bit more, you can get a different adjustable lanyard with a famous name that comes with forceps, floatant, three spools of tippet in different weights, a spool holder, a mini fly box, and snips. If you have a little more to spend, you can get a handcrafted braided leather lanyard with rawhide beads and a break-away clasp. If you have the money and inclination, you can get a top of the line fly fishing lanyard made of hand-braided leather. 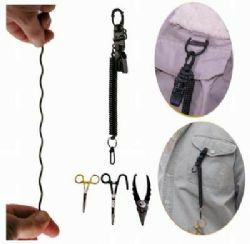 Completely adjustable, the lanyard comes with two mini clips and two micro clips to hold your tools. A central ring of stainless steel can hold forceps, scissors, snips, a flashlight, or anything else you need. Customized needs can be met with these handcrafted lanyards if you need something very specific.